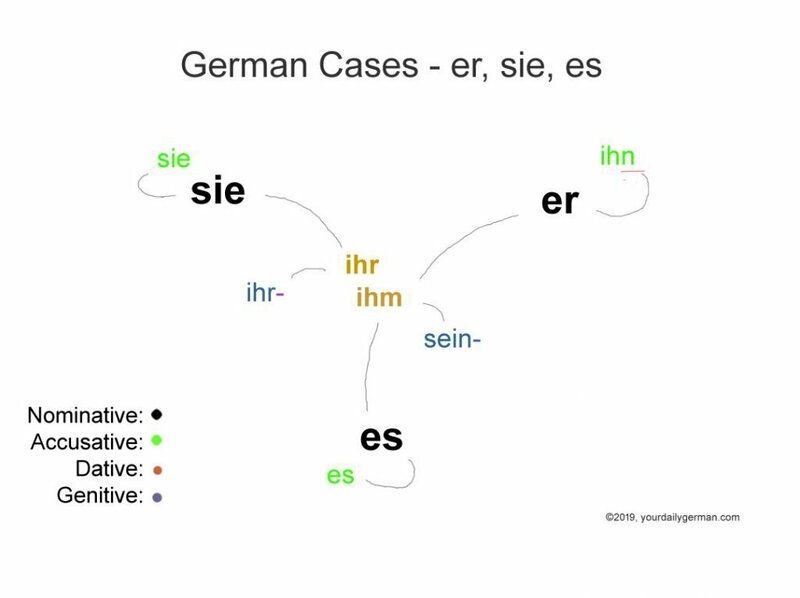 A new kind of case chart | German is easy! This entry was posted in /b/ random, Grammar. Bookmark the permalink. LOOOOOOOOOOVE these charts! I have actually tried to learn tables, but I find the ones with colours and overlaps especially confusing. I have a photographic memory, which means these ones are excellent for me to learn (I’m going to make flashcards with them as well and the images will defo pop to ming when I think of articles). You do have a knack for visuals, as I also love your drawings for the prefix verbs (still working on feedback on the app, haven’t forgotten). Thank you for these tables! Do you reckon you can (at some point) do something similar for adjective endings (daunting, I know)? Thanks for the corrections :). I motion that English make up its mind with regards to how to treat compounds (which English pretends not to have). Hyphen, no hyphen, one word…. it’s a real mess :). Glad to hear you like the charts!! I haven’t replied to you in a long time, but I love the fact that you put together such wonderful lessons! I love these!! I have always done what I could with the usual charts, but they never ‘stuck’. With your charts, the patterns suddenly fell into place, and I’ve been looking these charts up for decades. I can definitely remember yours. Thank you, danke, grazie, merci, gracias!! I was sad when , as Colleen noted, even though there is text saying that I can click on the image for a larger version, nothing happens when I click. My pleasure, bitte, prego, de rien, de nada :). I fixed the links now, so you should be able to see it full screen when you click the image (let me know if not, please). What have you used for diagram ? Technically there is vocatice and locative cases but mentioning them scares even Russian native speakers. Wow, that’s a challenge!!! To be fair, though, I didn’t display any “ich, du” or “mein, dein” stuff. Not sure, if we could use the same layout for Russian. That’s kind of the point actually, that you use the layout that best fits the material. I can’t do it for Russian, because I don’t speak it, and you need to know stuff like “how common is a form”. That matters a lot for the design. Just realised, going over the diagrams that my memory works on all my senses. Also that I am pronouncing eine and einer much the same. Now trying to amend that along with wurde, würde. I do not find the visualisation easier to understand. Sorry. It is confusing. It will get even more confusing when you add endings of adjectives in different cases. Oh, it would be impossible to read with the adjective endings in it. However, no one table has pronouns, articles and adjective endings in one. Do you learn the tables in a visual way or do you just use them as a reference if you need to look up a case? Very elegant, Emanuel, and I’m really glad that visual rememberers think it useful. My memory is apparently so non-visual that it never occurred to me to try to memorise the image. I’ve always thought of case, and verb, tables as being for finding info from, like lesson timetables, bus time tables, logarithm and trigonometric tables or tide tables. By repeated use I’d eventually remember all of a lesson timetable and the most used parts of a bus timetable, but not ever by trying to commit the image to memory. A case table would just be used to provide instant info or the sequences ( der, die, das; den, die, das; des, der, des;…..) to learn. If the fidget spinner could become a sort of grammar slide rule (Are you familiar with such old technology?) I think it might be very useful indeed! Thanks for the fun video with glimpses of Ljubljana (I suppose). Yup, Ljubljana… the mountain of the castle, if anyone cares :). I know these old grammar sliders but I’ve never used one. An interactive webpage would be cool also. Like …. you click “pronouns” and it shows the pronouns while keeping the layout. Nominative: RESE; Accusative: NESE; Dative: MRMN (MisterMN;) Genitive: MSMS — you get the gist. 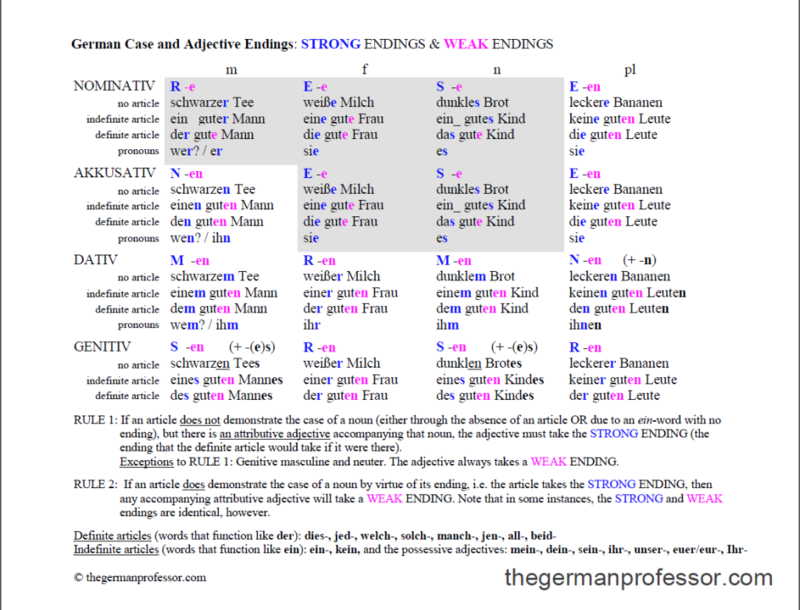 I used the same system for ein, eine, ein, (one or two last letters only…) and also the same for the adjetive combinations.). Not a chart, just a simple mnemonic device that may work for other beginners, too. I had never heard of RESE, NESE… but you’re the second person to mention it, so it seems to be somewhat known in the learning community :). Did that also help you with “er, sie, es” and “ein, eine, ein”? You’re absolutely right! I didn’t catch that when I was reading the comment. Ich bin aehnlich wie Ruth. Ich finde die Tabellen mehr intuitive, aber ich benutze oft Datentabellen usw bei der Arbeit. Echt gute idee, andere Formate zu haben, fuer Leute mit verschiedenen Lernstilen (ob das ein echtes Wort ist). Ich bemerkte, dass etwas ein bisschen komisches mit den Farben passiert. Die genitiven Woerter wind manchmal lila, manchmal rosa. Und im ersten Bild ist Dativ rot in der Legende aber orange auf dem Bild. Haha… ja, das mit den Farben passiert, wenn man sich bei Photoshop keine Notizen macht, und dann später nicht mehr alles nochmal ändern will. Aber es ist nicht so wichtig. Ich hatte erst überlegt, ob ich es ganz ohne Farben mache. Der Ort ist wichtig, nicht die Farbe. Und ja, Lernstil ist perfekt :)! Hi Emanuel, I agree with you. The visual stasis of a table’s right angles and perpendiculars make them stupefying boring and hard to remember. I find your use of humor and especially the cartoons addendums great mnemonic aides. Crazy as it seems, looking at the above “case” “displays” I see, “two eyes, nose, mouth” . I suggest getting crazy and trying your hand at one of your entertaining/informative renderings. Playing push the “chart” into your realm. You’re right, there is a face in there somehow :). I noticed the uterus that was there, but not the face. However, I think making the face more prominent would actually take away from the whole thing because it adds extra information. You’d then force people to see and process a face, whilst now you are free to see whatever. Brilliant! Bravo! Why hasn’t anyone thought of this already! TOTALLY understood it upon first sight – didn’t even need the explaination. Ema outdoes himself yet again! Oj, forgot to mention: why does everybody claim that there is no plural indefinate article? Kein works PERFECTLY as a plural indefinate article. Is it possible tonrequest that ”kein” be added to the indefinate artikle chart as the plural indefinate article? Hahahaha…. clearly, you spent too much time in university German classes :D.
Seriously though, you have a point. Also the possessives do exist in plural (meine, deine). Adding those would make it more cluttery though. What would be really cool would be an interactive website where you have the design as a base and you can just select which elements (def articles, indef articles, personal pronouns, demonstrative pronouns…) to display and then print it. 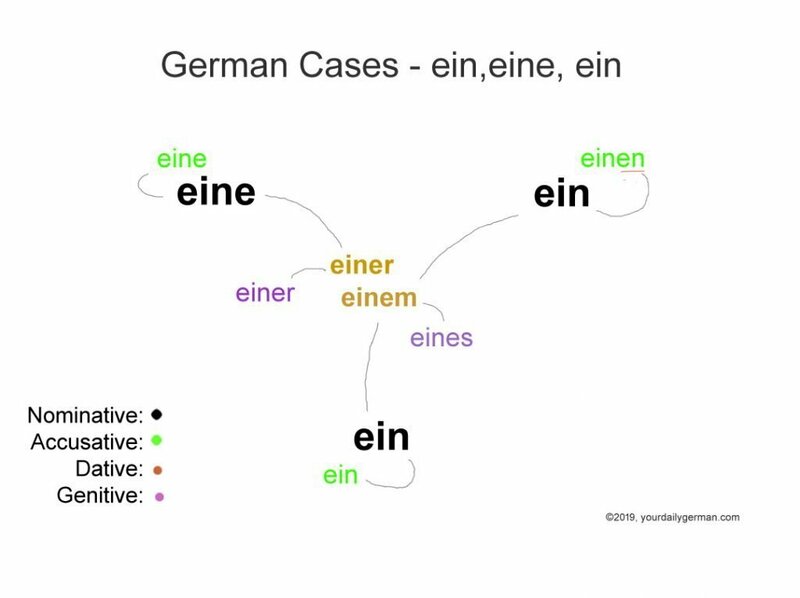 Would it be, like, too much to request that you add “Ihnen” in the “German cases: er, sie, es”? If it’s not too much of a hassle? Will wait to print out until perhaps, you have time to add it? Putting “kein” in there wouldn’t clutter any more than the plurals cluttered the definite article Fidget Spinner. And, it would give us a good, solid picture that would be useful for the possessives. Makes the picture complete, if you know what I mean – at present it feels like a beautiful house – – – ohne die Tür. I know, I should add it :). These things were really kind of made in a hurry because I was excited and wanted to get feedback. They’re a draft, so to speak. For what it’s worth though… you can draw your own fidget spinner until I am done :). The interactive version you’re describing wouldn’t be too hard to make in Shiny, I don’t think. I’m sure there are plenty of other ways you could do it too, of course. Oh, nice… I’ll check that out for sure!! Vielen Dank! Sorry to say that I find the coloured table easier to understand than the diagram. Excellent to have a diagram as an alternative to the traditional charts. I always found that copying down things like this, using my own, preferred colours, can help. I learned German up to A level and then continued via the Open University to do their Diploma in German Language and Culture. Sadly, through lack of use, my German language knowledge and skills have dwindled, but I thoroughly enjoy your articles to maintain some interest. I am currently learning Esperanto, which is delightfully simple in comparison to German and any other language that I have encountered. I shall be relocating soon and hope to find a German-speaking group with whom I could practise. In the meantime, “Bravo” for your articles – it is a pleasure to share your experience and enthusiasm. Thanks for the nice feedback :). Since you’re learning Esperanto… from what I know it’s a mixture of European languages, but on the surface I can only see Spanish and Italian. Did you recognize any German elements (grammar-wise)? I am also prefer the table, and the table’s overall organization. I find that when texts don’t use the order: masculine, neuter, feminine, plural in the horizontal setting, however, it doesn’t work as well. The table burned itself in my brain and I can visualize it when working out the German meaning. The idea behind your charts is awesome. I like the way you think and it’s definitely super useful to get one’s head out of the box (or table) when learning a language… unfortunately, I can’t tell if they’re better or worse – I’ve been deformed by years (and years AND YEARS) of learning from tables and the ones for German cases have seared into my brain so well that I literally see the table in my head and point my attention to what I need when dealing with cases, and I’ve been conditioned so well that it’s a very quick and visual process, too. Haha, yeah… I didn’t dare using that song because of Copyright. Anyway, glad to hear that you conquered the tables :). I’m curious? Can you recall all of them? I don’t even know how many there actually are? Between 6 and 12 to capture every aspect of the matter, I believe, depending on what each table includes. yeeeeaahh… no. The basic der-die-das-(die) is all I’ve got, and the rest can really mostly be derived from it as the endings are mostly the same (or follow the same logic). He’s called Magic Mike. I payed him well. I really like your diagram style. With flowing lines everything is more gentle and readable (once one has digested the accompanying explanation!). None of this hard right-angled LEARN THIS NOW of all of the text books. As for this specific job (case endings), I really don’t know, cos I got comfortable doing my tabular lookup whenever I was not 100% sure I was right about my choice. I think that you need the interactive online choose-your-own-case-diagram interface to make this idea really come alive, because there’s too much data to show in one clean diagram. I.e. I used ?193661 because it’s got the indefinite and definite adjective endings as well, which is the part I found took longer to remember properly. I have the link to the image saved as an “app” on my phone and I would literally pull my phone out and check the rule whenever I was unsure. I didn’t bother trying to learn the rules (and the exceptions), I just learned by repetition, looking up in the table, and “it sounds right” after a while. I find your diagrams much more intuitive. It’s something about understanding how the cases work for the different genders that just comes across much more easily from your diagrams. Now I just need to get a bit more solid on my genders, which is the constant ongoing struggle. Ah, I must be one of the minorities for whom this fidget spinner doesn’t work…I actually had to spend decent anount of time decyphering the legend and colors, and sizes…and a couple of things were still left unclear. I’m also not the hugest fan of tables, I prefer infographics and charts but I also don’t study tables. After the initial scrutiny, they are mostly referential for me, that’s why I never had problems with them. I wonder what the divide for like/dislike is between the more lineal (analytical) personalities and creative ones. Kuddos for the efforts to offer us something different though! I’m not sure, if you’re actually a minority :). Tables seem more accepted than I thought. Anyway, you said that a couple of things were left unclear. Could you tell me which ones? I’d like to know because I want to improve the chart. My gut tells me upon first looking that I’m spending way too much time trying to translate what I’m seeing. BUT, I can see how the shape and use of white space could eventually imprint in my brain and provide a useful memory tool, IF I can commit the meaning behind each location to that memory. I guess what I’m saying is it doesn’t at a glance seem more or less helpful than a table, but I’m going to print it out and see what happens after I’ve looked at it a lot. Anything to help with those annoying cases! I appreciate the effort! Danke! 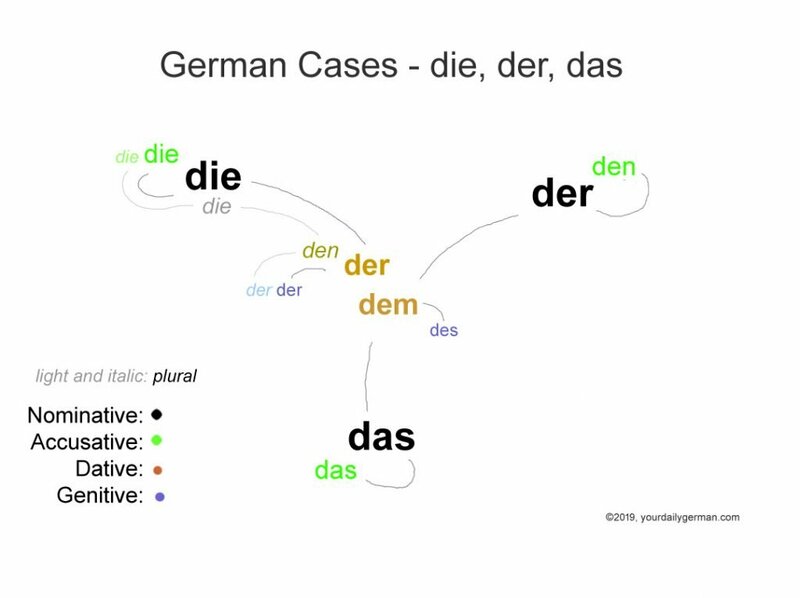 Here it is in a nutshell: The corners are the three genders (der, die, das) , Accusative is essentially the same except for “den” instead of “der” and in the center is where the REAL changes are: Dative. Two options there, der and dem. And then there’s Genitive, but no one really cares that much on first glance. Don’t try to remember all of it. The main point is the Dative. I find the tables more intuitive. To add font size Doesn’t help me much. Perhaps I have been suffering with these tables for too long by now. Well, if you already know all the tables, then I guess they’re more intuitive. But you have to admit that you won’t forget the “visual” component of my chart and that the gender are three corners. Maybe I should make it a three step drawing. First, the three genders, then adding Accusative and then Dative in the center.